Staying in Cantabria, Spain has its benefits: it’s a 30-minute drive to the Guggenheim museum in Bilbao, it has luscious green countryside dotted with caves containing early human paintings, and it’s unspoilt by foreign tourists – meaning it still has some really great, secret Cantabria restaurants. One of them is La Lonja in the fishing/port town of Santoña. It’s right on the edge of the port and you can’t miss it – the whole building looks like a ship. The bar and restaurant are on the ground floor, overlooking the waters from whence your dinner came…and mere hours before! Since this is a seafood restaurant right on the fishing pier, I am committed to having octopus and fresh fish, but not before I start with some jamón ibérico, or pata negra. One of my missions on this trip had suddenly become eating jamón ibérico at every meal, or at the very least, every day. I was not disappointed by this cured meat made from the black Iberian pig indigenous to Spain, partido a cuchillo, or hand-cut by knife the artisinal way. No slicers here. 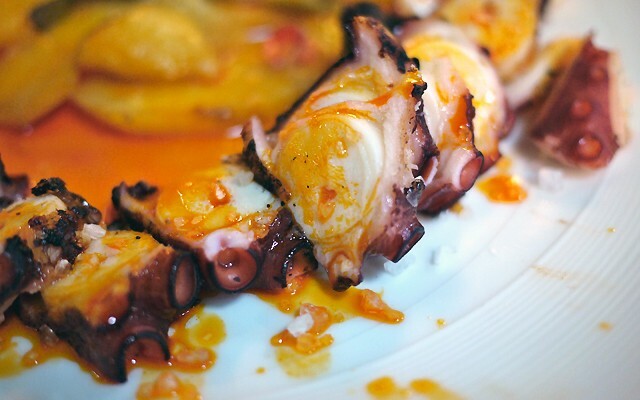 The Pulpo a la brasa, octopus from the grill, was perfectly cooked and served with chili oil, potatoes and peppers. It had such a soft texture, with a lovely fire-grill taste on the outside. Next was besugo (sea bream or snapper) from the grill, cooked with olive oil, white wine and garlic. Filleted at the table and served simply on its own. All washed down with a crisp white Ribera del Asón from the local province, Voto. This simple non-appellation blend of Albariño and Chardonnay was a perfect complement to a perfect starry night at the unspoilt, and yes perfect, edge of Spain. Fantastic food. Spanish style, eating in Spain is spectacular. In my opinion they are top in food presentation. Their Jamon is cut in such thin slices that makes it miraculously tastier.